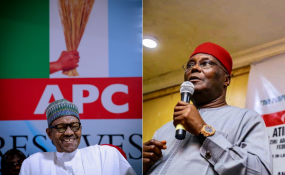 Buhari Versus Atiku - Who Wins the Presidency? As the February 16 presidential election draws closer, mushroom political parties are at daggers drawn with the two major political parties, President Muhammadu Buhari-led ruling All Progressive Congress (APC) and opposition Peoples Democratic Party (PDP) with former vice president Atiku Abubakar as its presidential flag bearer. Prominent among them are: the Social Democratic Party (SDP) with former Minister of Information, Prof. Jerry Ganna, former World Bank Vice President and Minister of Education, Dr. Oby Ezekwelisi of the Allied Congress Party of Nigeria (ACPN) Prof. Kingsley Moghalu, a former CBN Deputy Governor, who flies the banner of the Young Progressive Party (YPP) and Omoyele Sowore, presidential candidate of the African Action Congress (AAC). Indications have shown that the APC and PDP have not only themselves to contend with but also with other expanding forces that may not only give them the run for power and money but also to checkmate their activities before and during the elections, giving the influence their voices continue to command in shaping the 2019 electoral process. The presidential candidate of Allied Congress Party of Nigeria, ACPN, Dr. Oby Ezekwesili, who had persistently called on Nigerians to reject both the APC and the PDP, describing both as same, has launched her nation-wide campaign to stop the PDP and the APC. Leadership recalls that the former minister in one of her tweets had promised to launch a massive campaign against the APC and the PDP if they failed to project competent hands in 2019. In a recent event, while featuring as a discussant at the Osasu Show Symposium in Abuja, in her reaction to an interjection by Mr. Segun Sowomi, who represented Atiku Abubakar at the event, Dr Oby took a swipe at the presidential candidate of Peoples Democratic Party, accusing him of opposing the establishment of Due Process Unit when he was Vice President. "Can I tell you something, the candidate that this gentleman happens to represent was the one while in office gave me the greatest fight against establishing the Due Process Unit", she said. Prof. Kingsley Moghalu, the presidential candidate of the Young Progressives Party (YPP) has also put up a show to prove his seriousness to lead in the nation's leadership front. Prof. Moghalu has the confidence that he will defeat the All Progressives Congress (APC) in the Feb. 16 presidential poll. Moghalu, at a town hall meeting tagged: 'The Candidates' organised by the MacArthur Foundation in collaboration with NTA and DARIA media in Abuja, expressed confidence that he would emerge president. He said that Nigerians were "tired of recycled politicians" and that the Peoples Democratic Party (PDP) was not an option. "We will defeat President Muhammadu Buhari and the reason is very simple, Nigerians are tired of recycled politicians and the PDP is not an option. "Going for the PDP from the APC is like jumping from frying pan to fire", the former CBN boss added. Omoyele Sowore, presidential candidate of the African Action Congress (AAC) and publisher of online newpaper, Sahara Reporters, who started his campaigns earlier, has become a thorn in the flesh of the two major political parties. Leadership can recall how Mr Sowore who engaged a former Minister in the Buhari cabinet in a hot radio debate in April 2018 that attracted audience across the world, had recently filed a suit against the Nigeria Election Debate Group (NEDG) over the exclusion of his party from the vice-presidential debate which was held on December 14, 2018. Sowore whose supporters had stormed the venue of the debate protesting the exclusion of their candidate for the debate has continued to berate the candidature of President Muhammadu Buahri and former Vice-President Atiku Abubakar, stating that the choice between Buhari and Atiku is one "between failed participants in Nigeria's democratic history". "Those who are positioning themselves to lead Nigerians today, are the same people who caused Nigerians pains and sorrow that Nigeria is in today", Sowore had said in one his town hall meetings with Nigerians in diaspora.